It was one of those projects which I am sure you can relate. The kind that keeps you up at night as you imagine and feel yourself doing the moves. If given the chance, you would drop everything to travel across the world just to have another try. For Randy Puro and a few others, that line was the low start to Lesson Six. Randy recently made the voyage from California to Squamish, specifically to revisit this old project of his. He mentioned that the holds felt different, larger even. He thought it might have been chipped. Later confirmed by locals, the work is obvious as seen in the photo. So it’s official. 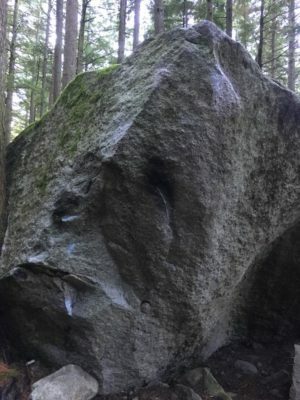 Squamish has its first confirmed chipped boulder to date and hopefully, the last. 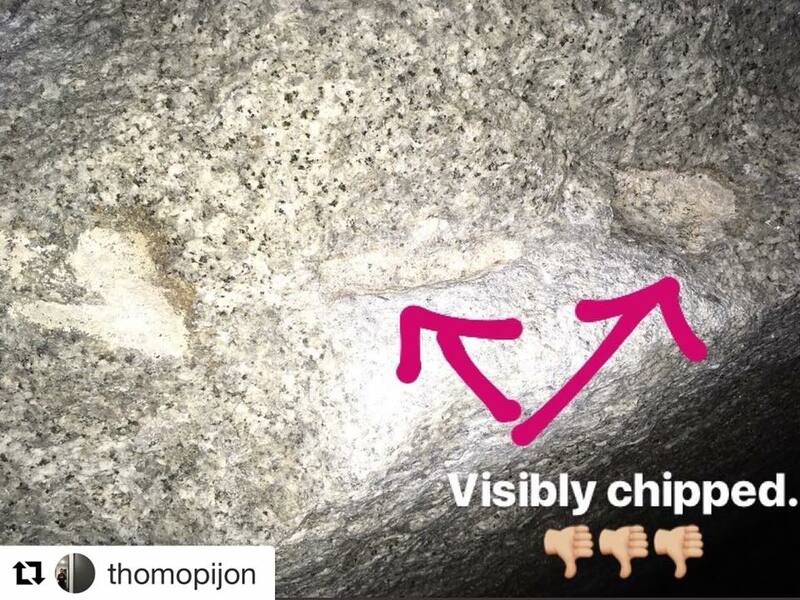 Without going into the tiresome debate of ‘to chip or not to chip’, it can be safe to say that 99.99% of the local and international bouldering community do not condone chipping. While the opinions of some route climbers may differ, boulderers are outraged at such a blatant disregard and disrespect for not only the rock, but also for the vision and capabilities of others and generations to come. This problem in particular was very special because it represented the next level for Squamish bouldering. A steep rail of beautiful slopers, the movement required raw power balanced with the subtle balance of squeezing which is so classic of Squamish. Unfortunately, the satisfaction of conquering something in its natural and original state, was selfishly stolen by the limitations of another; someone without the vision, necessary strength, and skill to climb it in its original state. For those capable of trying a boulder this difficult, such lines are few and far between. While some may need lifetimes before they out climb an area, there are a few who do not. This is why some of the worlds strongest and most inspiring climbers, such as Randy, Jimmy Webb, and Nalle Hukkataival travel across the globe seeking such challenges. They too need clean and inspiring lines to climb! Unfortunately, problems of such difficulty are becoming an endangered species due to certain people dumbing it down to their ability. This action is a complete disappointment to the bouldering community. Like any great line, it’s send was really, only a matter of time. Randy describes the incident as heartbreaking. 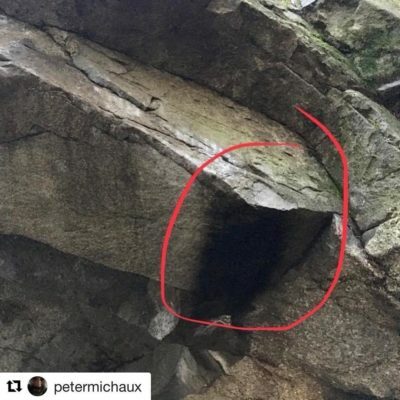 Let it be said that the chipping happened on a monolithic piece of high quality granite in the Grand Wall Boulders which are situated in a provincial park. I am putting emphasis on the word monolithic, meaning, it is not choss that may just happen to break off. This action was intentional. Chipping is NOT ok. Vandalism in a provincial park is NOT ok. Chipping is vandalism. Making a route or boulder problem safe is one thing, chiseling out holds for comfort or ease is another. While some folks underestimate or excuse this act simply because it has been done in the past, does not mean it is ok now. Let’s leave the chipping to the hold companies and route setters. As climbers, we have a responsibility for our public spaces. Leaving tick marks and garbage is one thing, but chipping is irreversible. Ironically, just a few days later, blow torch soot was seen on the classic problems, Tim’s (originally Stu’s) Sloper Problem and Titanic. Like a large and obnoxious tick mark, the dark soot stood in stark contrast to the once clean rock. The method of using a blow torch to dry rock has been tried and failed. The intense, localized heat causes holds to expand faster than the surrounding rock which can break holds. To use a drying method that will leave such damage on a rock is unexceptable. As an alternative, Makita makes a nice cordless blower that will do the job and not heat the holds. Otherwise, climb out in the open where it dries faster or climb inside. There are options that will not tarnish the rock or experience for everyone else. As a guest in the forest and desert, it is assumed that we enter with the mentality to “Leave No Trace”. As climbers, it is our job and responsibility to be stewards of the forest, to take the lead in protecting it for generations to come, to set a precedent higher than those before us. This includes removing garbage, tick marks, staying on trails, and leaving a boulder or route in its original state. It will only be a matter of time that someone stronger than us will be capable of climbing it; we do not have the right to steal this from them. It is a privilege to climb in the Stawamus Boulders as it is in any area. A privilege, which could easily be taken away. Enjoyed this post? Help fuel the fire. Thank you, Danke!